Our flagship product. A smooth drinking, handcrafted, craft certified gluten-free spirit. We ferment carefully selected grapes in micro-batches in our small pot stills. That time-honored tradition truly yields a genuine taste. The Lazy Eye Special is a cocktail created using our gluten-free vodka distilled from grapes. More importantly, it was born in our home. Our special has been enjoyed by our family and friends celebrating life’s events and holidays throughout the years. Now we would like to share our “Special” cocktail with you. 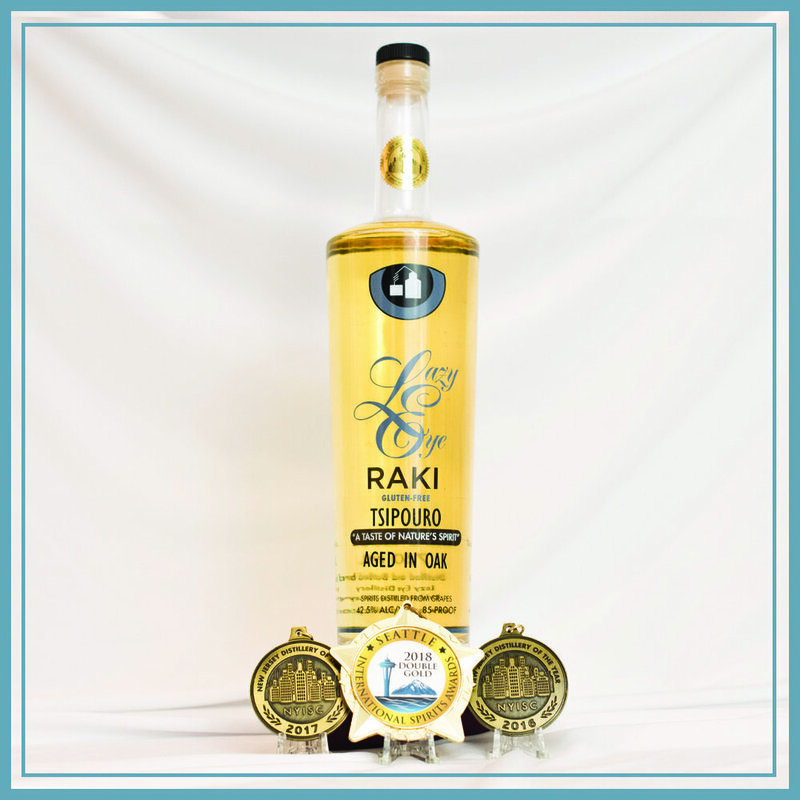 Lazy Eye Raki (Tsipouro) finished with anise pays tribute to the “Greek Spirit” of our parents and grandparents and the values that they instilled upon us. As a result of careful fermentation and distillation in our small pot stills, the character of our Raki (Tsipouro) finished with anise. As an aperitif or digestif, it pairs well with cuisine from around the world. Enjoyed neat, chilled or on the rocks, the choice is yours. Lazy Eye Raki (Tsipouro) pays tribute to the “Greek Spirit” of our parents and grandparents and the values that they instilled upon us. As a result of careful fermentation and distillation in our small pot stills, the character of our Raki (Tsipouro) is dynamic. As an aperitif or digestif, it pairs well with cuisine from around the world. Enjoyed neat, chilled or on the rocks, the choice is yours. We are excited to announce that there is now a spirit for everyone in our tasting room. We take pride in the consistency and crispness of our clear spirits. The result of aging them for a year has been more than we could have ever hoped for. The complexity and smoothness of our new aged spirits have been pleasing the pallets of aged spirit enthusiasts in our tasting room. Whether you prefer your spirits clear or dark, there is now a spirit for you in our tasting room. The addition of our barrel-aged spirits has allowed us and our fans to create an assortment of delicious barrel aged cocktails. The best part of this business is the interaction that we have with our fans. We thank all of you for the continued support. We look forward to you sharing your cocktail recipes with us. We also have a unique product that is unique to Southern New Jersey coming this fall. Over a year ago we decided to put our Vodka in a barrel. It was simply an experiment. We had no idea that the result was going to be a revolutionary spirit. 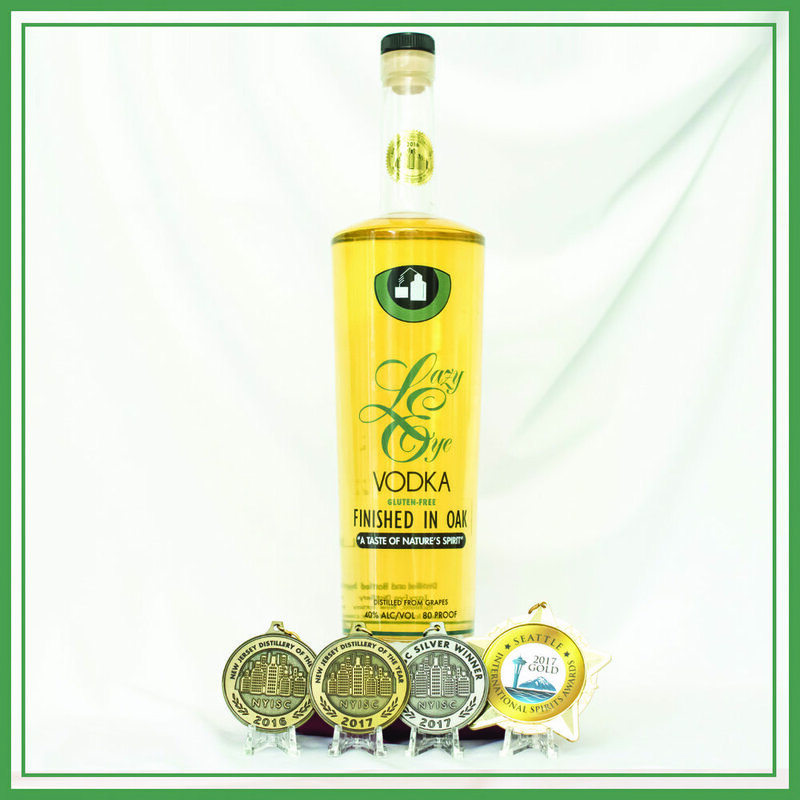 You have most likely never heard of or tasted aged Vodka, you are not alone. This is a truly unique spirit that offers the familiar smooth and crisp taste that is synonymous with all of our spirits but also offers a different level of complexity that has been intriguing brown spirit lovers in our tasting room. Over the next couple years, we are sure that the big companies will be releasing their own revolutionary aged vodkas. Just remember, Lazy Eye Distillery did it first. The most unique spirit in our tasting room just got a little more unique. As the producers of the only legally made Raki (Tsipouro) in the United States, we decided to take our Raki (Tsipouro) to the next level by aging it in oak barrels. The result is a complex spirit that has created its own identity and has captured the imagination of brown spirit drinkers.